Human beings are efficient. As soon as we invent technology, we apply purposes to that technology. 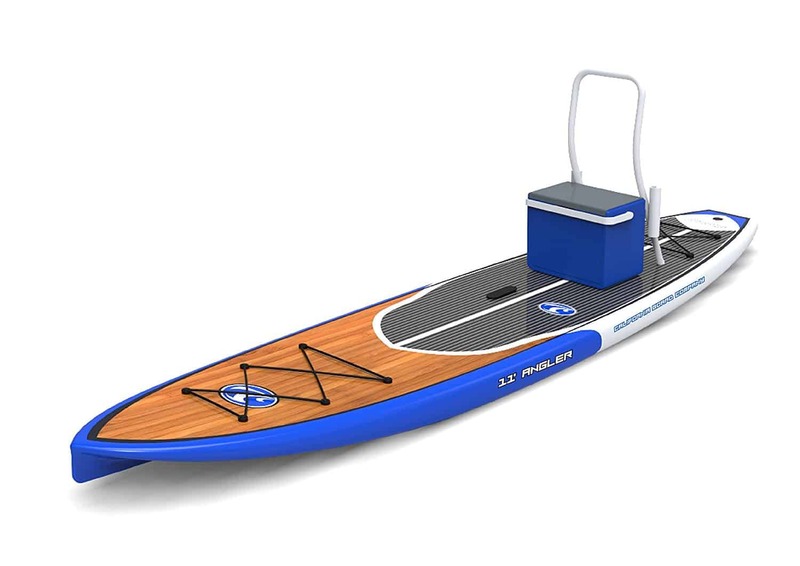 Inflatable stand up paddle board (iSUP) was intended for paddleboarding. But shortly after their invention, people came up with new ways of them. Today, they are used for paddleboarding, kayaking, yoga, and most importantly for us, fishing. Why not, right? They are comfortable, balanced, and have enough room to hold you and the cooler, perfect setup for a comfortable fishing day. In this article, we will not firstly present you the top five inflatable paddle boards. Aside from that, we will provide you with a buyer’s guide, where we will explain the benefits of using an iSUP, and what things you should pay attention to if you decided to obtain one. 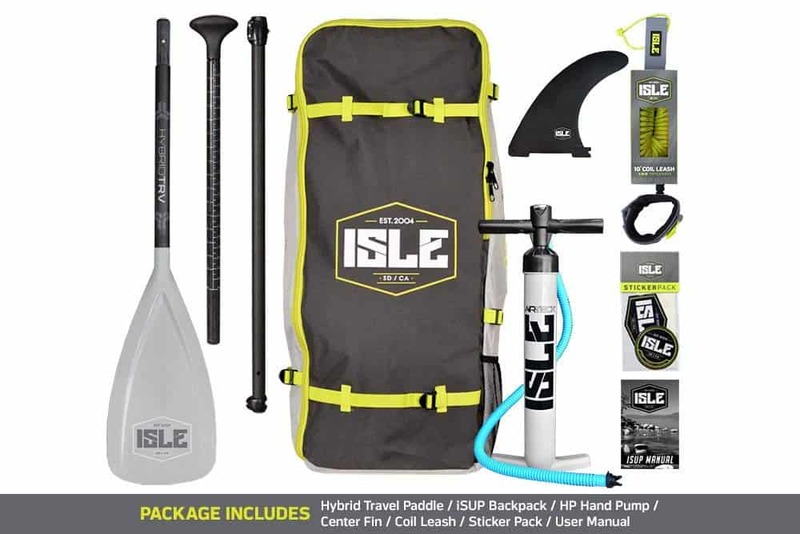 Inflatable Fishing Standup Paddle Board – The Stand up Paddle board fishing world has been shown a whole new perspective with this portable, compact ISUP that opens up many possibilities for fishing. 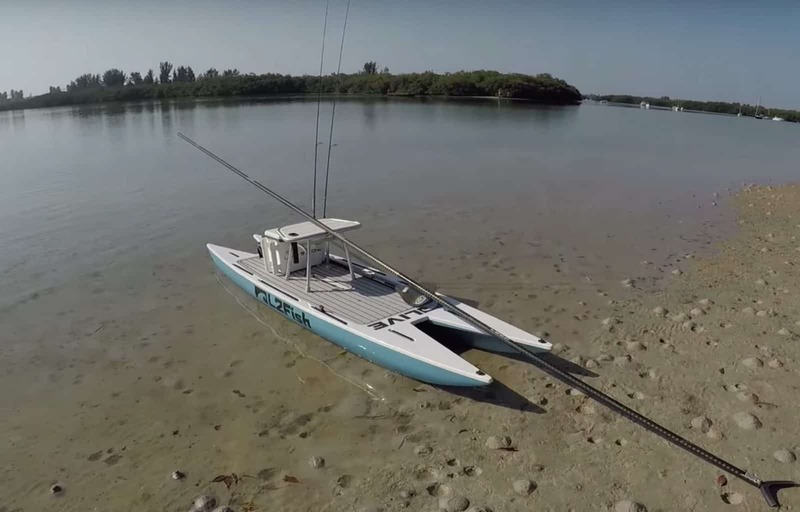 The Fish Stalker iSUP uses a very interesting catamaran hull design that offers amazing stability while still offering an effortless glide and efficiency, while creeping up on your favorite fishing holes. Packing a cooler is easier than ever with multiple tie down areas. The setup also includes some Ram mount Tough Balls so you can use Ram accessories and set your board up just how you like for a day on the water. The construction of the board is inflatable military grade PVC that is the same material the is used on a Zodiac. This is extremely tough and can take a beating. One hook in an inflatable and you will be swimming home. 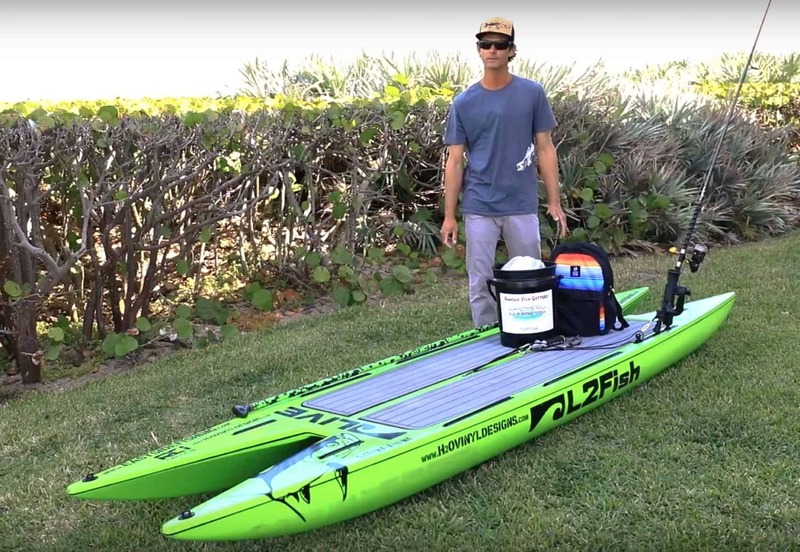 The L2’s catamaran style hull really gives you the best stability possible without killing speed so you’ll have plenty of energy for a day of SUP fishing. It is so stable in fact, that Live Watersports tells it’s users to try try out SUP yoga on it. 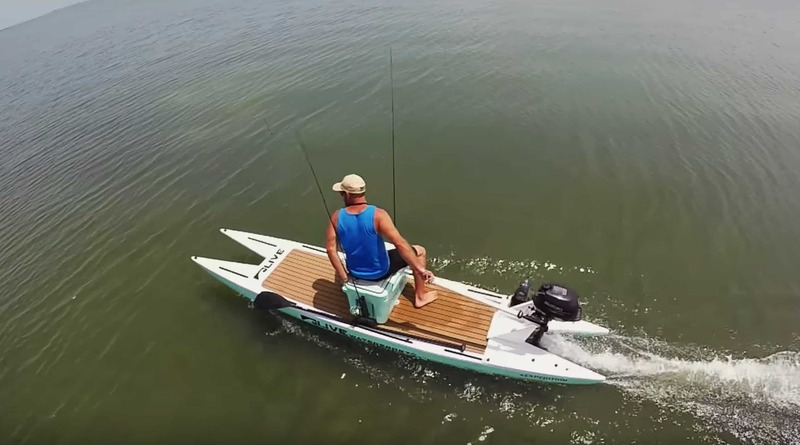 Not only is it stable, but this fishing paddle board offers you a ton of space for coolers, gear, or your dog to tag along. There tie down spots all over to safely secure your stuff. The wide hull also gives you premium roll resistance which is great in surf. The L2Fish has 9 gear tracks on the board which make the possibilities for customizing this board endless. The board can also have a Larry chair fitted to it or even a cooler that can fasten to the tracks. This also goes for fish finders, rod holders, cup holders, and darn near any piece of gear you can think of. Manufacturers like Scotty, Railblaza, and Yakattack, can mount their accessories on track systems like the one found on the L2fish. So no worries mounting your favorite gear. The Live Watersports L2Fish is extremely fast, stable, and an easy SUP to configurable which makes it every angler’s dream to have. 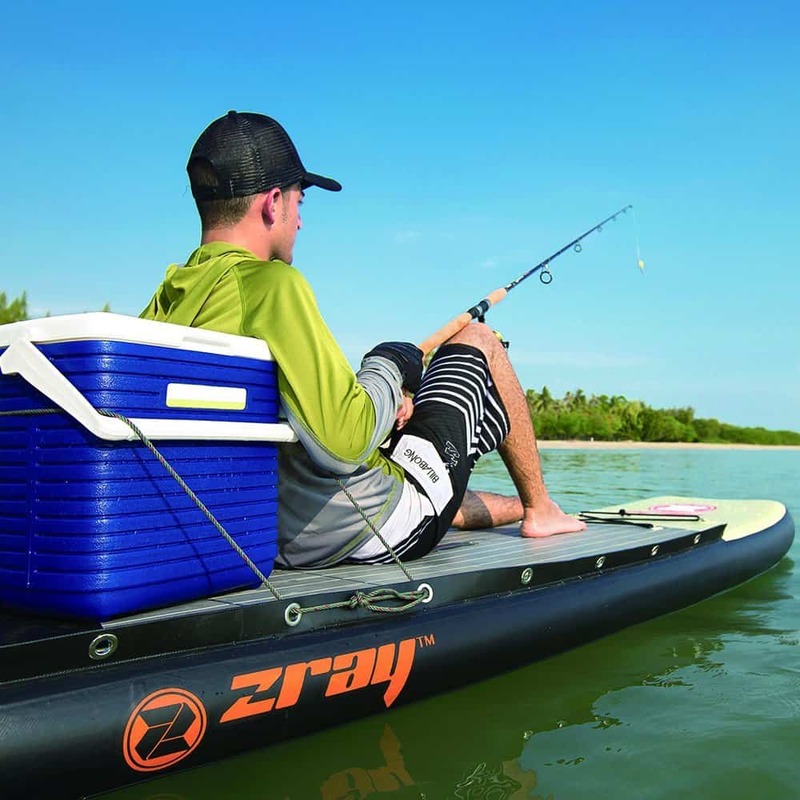 Unlike the previous product, which is a good all around iSUP, the Z-Ray board is made specifically for anglers. The board is 11 feet long, 6 inches thick and 32 inches wide, having three fins for extra maneuverability, of which the center one is detachable. This board features multilayer design. The outer layer is a durable and heavy PVC mesh, reinforced with a PVC rail, which makes the board more controllable and durable. Beneath it is the extra PVC layer, which makes the board fixed and resistant to wave and water disturbance. The board’s surface features EVA antislip footpad, comfortable and secure. The entire outer surface is drop-stiched, allowing the board to be inflated up to 15 PSI. Being 32 inches wide, the board is an excellent fit for anglers. Moreover, the wide surface grants a lot of space, allowing you to carry all the equipment you need. Also, the 4 point mesh is flexible and stretchable, enabling you to fix the portable cooler and enjoy your day. The board itself is portable and easy to carry. The board itself weighs roughly 23 pounds but is capable of carrying up to 330 pounds, which is quite impressive. 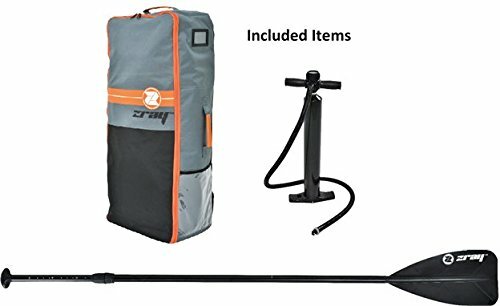 You will also receive a manual hand pump, paddle, and a backpack. It is also the most inexpensive board on our list, which is certainly a plus. Though the product is durable and quality made, it looks somewhat cheap due to the glued parts. Also, the paddle you receive is a bit heavy but still adjustable and usable. All in all, it is a solid, durable fishing paddle board with excellent balance and carrying capacity. 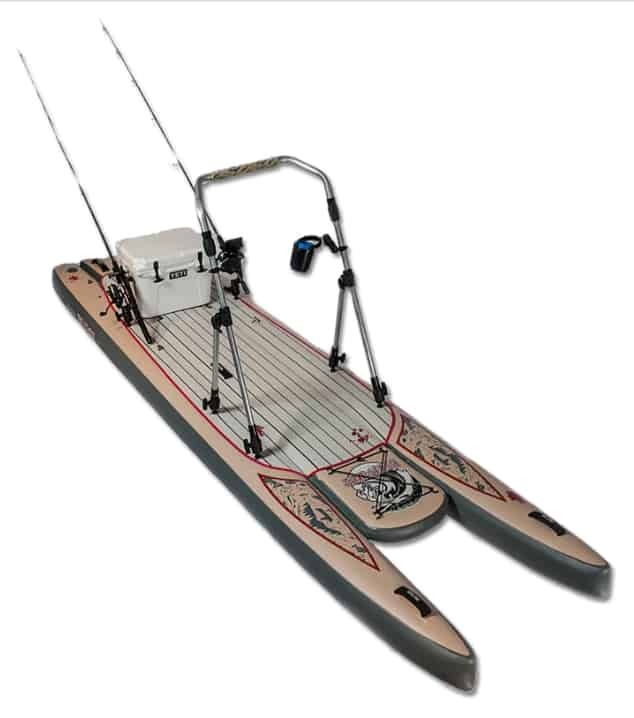 ISLE Sportsman iSUP is 11 feet long, 6 inches thick and 36 inches wide. While it is the most sophisticated and robust fishing paddle board on our list, it is not the most expensive one. 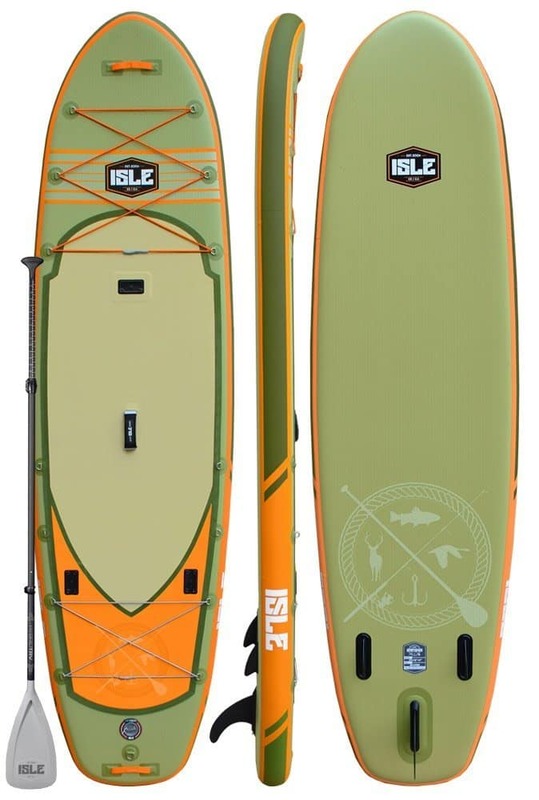 ISLE stand up paddle boards are a fit for adventurers, anglers, and explorers. You will also receive an aluminum 3-piece paddle, adjustable for people of all sizes. The coil leash is 10 feet long and will ensure that you are both safe and stable while on board. The hand pump is quality-made and will help you inflate the board with ease and comfort. The board comes with the detachable central fin, very easy to install and uninstall. The product is highly compact once deflated and will fit in the carrying backpack you’ll receive upon purchase. The entire board is covered with military grade PVC skin, which will extend the board’s durability, comfort, and resistance. Interestingly, the board features two bungees, the 6-point net on the front and 4-point on the back. It also has Scotty mounts which allows you to add fish finders, fishing rod holders, and anything else you might need. The board is very stable and is great for fishing. Anglers will probably love the extra storage this board provides, as well as the balance it grants on water. The board is a bit bulky and slow on the water, which is a downside if you expect on using it for something other than fishing. 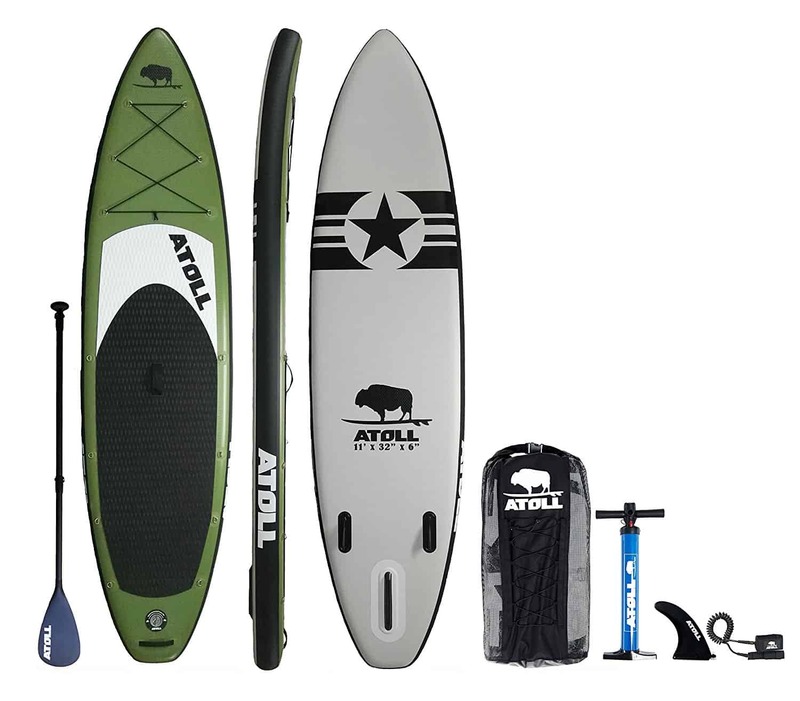 Atoll Inflatable Paddle Board is 11 feet long, 32 inches wide and 6 inches deep. This paddleboard is exceptionally lightweight, certainly lighter than its competitors. The product is light thanks to the new PVC design, which offers more comfort and lightness, without sacrificing the robustness and durability. The board is stable, fast and safe, fit for beginners and advanced paddlers. Upon purchase, you receive high-pressure manual hand pump, removable center fin, repair kit, bungee, and backpack. The pump is quality made, functional, and will help you inflate the paddle rapidly, without too much effort. The fin is detachable, meaning you can install it or uninstall it according to your needs. You will also receive a 3-piece, aluminum made a paddle, highly adjustable and lightweight. Also, you will receive a 10 feet long safety leash. The board s very lightweight but can carry up to 300 pounds. Note that the product has been tested on the water, where it can withstand up to 350 pounds of weight. The product features three-fin design, making it easier to track and glide across the water. When it comes to durability, this paddleboard features high-quality PVC multilayer designed and is double stitched to prevent leaking. It is very compact once deflated, easy to carry, store and transport. It is spacious, fit for relaxed anglers who want to spend a day on their favorite lake. The only issue we found with this paddle board was that is was very hard to inflate. Also, the pressure valve should have been built in a more sophisticated way. But, other than these small issues, the board is stable, durable and spacious. This is virtually an unknown board to me as I just bumped into it. It looks to have all the features of a nice paddle board for fishing, but I have yet to personally test it so I cannot say for sure. If you know much about this board or would like to review it on here, please contact me here. Weight capacity of 325 lbs! Rod & Gear Rack for 2 poles plus all your gear! I will be sure to add more about this board if I get the chance to try it or have someone review it. In this section, we will discuss the advantages and disadvantages of using an inflatable stand up paddle board (iSUP) for fishing. Moreover, we will see discus under which conditions the iSUPs strive, and under what circumstances you shouldn’t use them. Note that we will tie all this information to fishing (this guide isn’t general, but mainly related to fishing). We will end the article with brief Q&A section, where we will ask and answer some of the most common questions regarding the issues. Alas, we will round up our article with the concise conclusion. Compactness: inflatable paddle boards are easy to carry, transport, and store, since you can deflate them when you are no longer using them. Stability: iSUPs are often stable and balanced, allowing you to relax and enjoy the view. You will have more time to focus, explore, relax and enjoy the environment. Comfort and Convenience: iSUPs are very comfortable and convenient. You can rotate without the need to rotate the whole board (which is often not the case with kayaks or boats). You can move across the board, especially if it is spacious. iSUPs are less stable if you compare them to kayaks or fishing boats. Though most iSUPs on our list have 32 inches in width, this still doesn’t guarantee your stability and safety on the water. In this section, we will discuss how you should or shouldn’t use the inflatable stand up paddleboard. Don’t think of these pieces of advice in strict terms. Think of them as a recommended guides to optimal usage. Firstly, mind the restlessness of the water. By this, we mean that, although inflatable paddle boards are stable and balanced, they do float atop the surface of the water. Having that in mind, iSUPs feel every stronger wind, every more enormous wave, and so forth. Furthermore, the board’s surface is prone to slipping. Though manufacturers try to implement the anti-slip technology by introducing different materials, the board will still be slippery, especially if it is raining or if you are encountering bigger waves. As we stated before, storage can be an issue for anglers. You have to plan, and consider the number of rods you plan to use, the bait, the lines, and so forth. Most fishers attach their equipment to the deck. Mind that you can use the bungees to secure the equipment’s position further. You could also strap it to the side or the back of the board. The benefit of having your gear on the deck is the adaptability, that is, being able to switch and find the necessary equipment quickly. You have to make sure that the lines don’t intercept each other if you use multiple fishing roads. Since it can get pretty messy once the fish catches the bait, it is important that you have enough space, and that the lines are unattached. Consider using stripping mat or basket to ensure that the lines don’t mesh and intercept since this can ruin your ideal fishing experience. Alas, we come to the part where we will go into the technical details regarding your selection process. Be aware of the fact that we will only discuss the things we find to be essential. For instance, we won’t discuss whether you should look for carbon or aluminum paddle, or is it better to attach the fin or not. 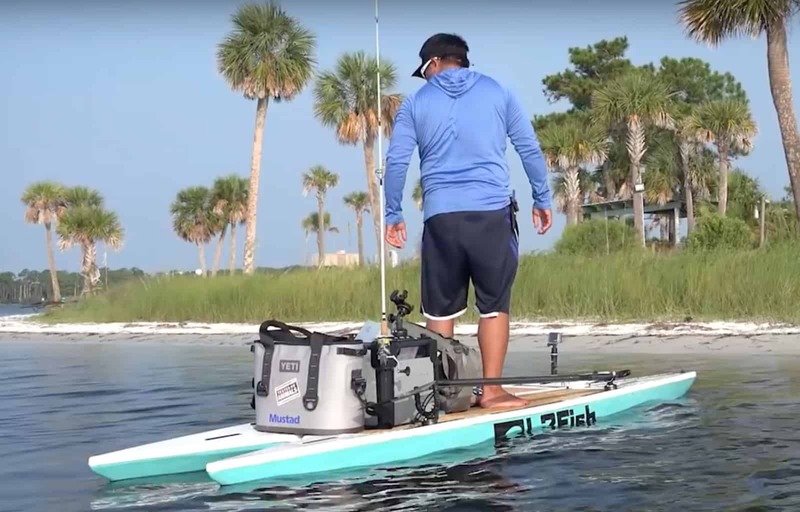 These things aren’t crucial when you seek inflatable paddle board for fishing: we are only concerned with the relationship between fishing and paddle boards. While reviewing our boards, we mentioned carrying capacity. Generally speaking, the wider and the board and thicker the board is, the more weight it can withstand. Wight capacity varies from 250 to 400 lbs (roughly). You should calculate not only your weight and the weight of your equipment, but also the potential weight of the fish you plan on catching. Board’s size is somewhat related to the weight capacity. Regarding the dimensions, we have length, width, and thickness. The products we reviewed are either 10 or 11 feet long. Length helps you carry more weight, meaning more gear. Moreover, it offers you more maneuverability. However, I would say that width is far more important. Width plays a huge role in balance and stability of the board. The wider the board, the more surface it covers, and the more stable it is. However, more width equals less maneuverability. Though, if you are an angler looking for iSUP, you probably don’t care much about maneuverability and adventurers capabilities of the board. Thickness (height) is arguably the most important feature regarding the board’s dimension. The board we reviewed are all 6 inches thick. Even if you don’t obtain the products from our list, we still suggest that you look for those that are at least 5 inches thick. Why? Well, being 6 inches thick means that the board will float well above the surface, i.e., the water won’t overflow the board’s surface and wet your feet. Moreover, thickness plays a role in the board’s durability, comfort, and resistance to the water’s roughness, waves, and winds. Consider the board’s design regarding comfort. For instance, does the board have a dedicated sitting foam or not? How thick is the board? How soft is the upper layer of the board? We didn’t discuss comfort that much because, well, these are all standing board. However, some boards on our list do have a dedicated seating area, which you should pay attention to if you mind these things. Firstly, consider the bungee system. Is it 4 or 6 point bungee? Is it one or two bungees? Bungees allow you to store items securely and conveniently. Furthermore, consider the number of D rings the paddleboard has, for they allow you to connect and secure cargo with ropes (ropes that are tied to and through the D rings). Alas, consider the board’s size. Logically, if you obtain the bigger board, know that you will have more storage space and more comfort onboard. Here, we would like to discuss some of the most common questions, while simultaneously provide answers to them. Again, these answers are the only potential solution to the issues at hand, not the only solution. Q: How To Maximize The Board’s Space? As we said, the cargo can become an issue with iSUPs. So, think of how you can turn a single item into a multipurpose item. Consider cooler. It can cool your food, but can also act as a seat. Furthermore, some of the paddleboards are explicitly designed for fishers, and feature rod holders. Also, some products come with a waterproof bag, which you can use as an onboard storage place. If the bag is not included, consider obtaining it additionally. But, make sure you strap it and fixate it to the board. Q: How To Stabilize The Board? For starters, consider carrying a small anchor. These boards are fairly lightweight and are made for gliding, paddling and floating across the surface of the water. Attaching a small anchor to the board will help stabilize the board. Some of the boards have built-in systems (those that are made for fishing exclusively. However, if you have a regular inflatable paddle board, you can attach the floating objects to the board that will help stabilize it. Q: Where Should I Keep The Fish? Well, if your board is spacious, you can bring extra cooler. Or, you can bring a cooler that is divided into two parts: use one part for your food and drinks, and another part for the fish you catch. If not, bring a bag for the fish, and place the bag in the cooler. The only problem with this is that the fish will radiate heat and warm the cooler rapidly. If you went through our article with care and attention, we hope it was entertaining and helpful. 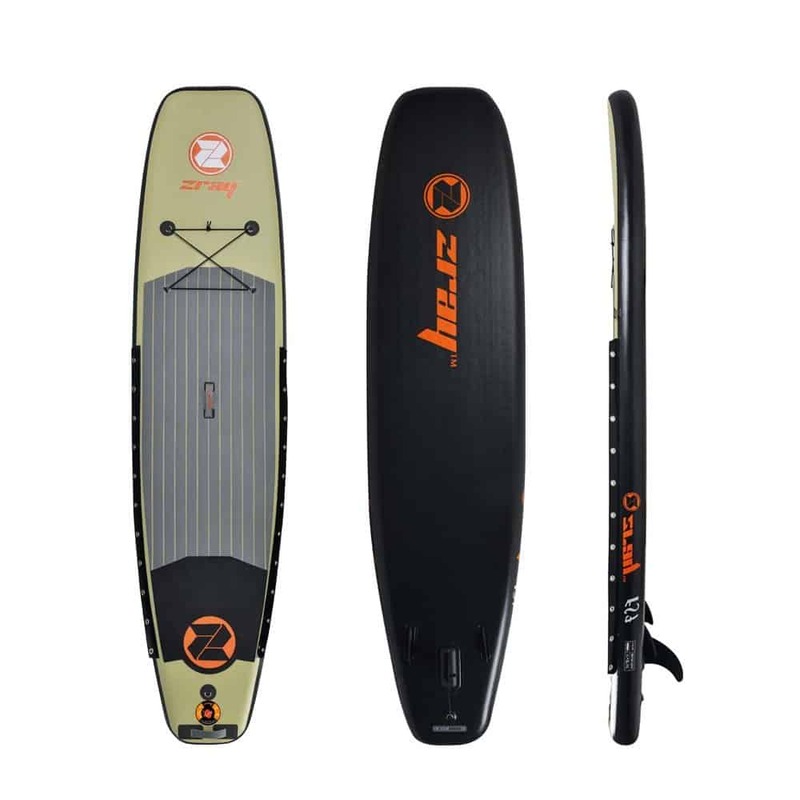 Moreover, we hope that it will not only help you pick the right product (if you do decide to obtain it) but that you also learned some valuable information regarding the inflatable stand up paddle board. If you are a complete beginner in the world of iSUPs, go through our guide with great attention, for it will help you narrow down your choices. Also, consider as many factors as you can, even those we didn’t discuss, for even the smallest detail can make a difference between unhappy and happy angler. Thanks for reading our article on the best fishing paddle boards. 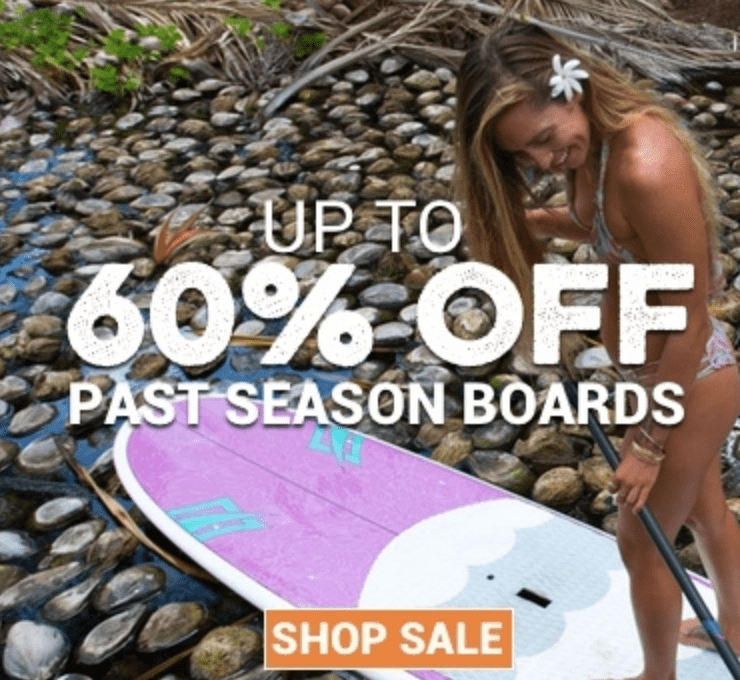 Be sure to subscribe to SUP Boards Review to get the latest coupons and savings on SUP’s and gear. Previous Post: « Is Stand Up Paddle Boarding A Good Workout?